Like many of our summertime meals, this Grilled Salmon with Wilted Spinach, Orzo and Feta cheese was quick to pull together. After buying wild salmon off the docks in Newport we quickly headed home. The plan was to leave out enough salmon for a few days and then freeze the rest. While the frozen salmon will be delicious, the fresh salmon will literally melt in your mouth. Salmon is a great conduit when adding flavor but sometimes it is wonderful on it’s own with a little salt, pepper and olive oil. Because we eat so many salads I always have some type of grain, bean or pasta on hand which is helpful in creating layers of flavor. In this dish the spinach was lightly wilted and orzo pasta was added from leftovers the previous day. Life is simple and good here. We are very fortunate. Prepare outdoor grill for medium- high cooking over direct heat (click here for instructions minus the mesquite chips). In a large skillet on medium-high heat add olive oil, when the oil is shimmering add spinach. Remove the leaves from the pan as soon as they wilt. Set aside. In a large bowl, toss the warm orzo, spinach, tomatoes and pine nuts. Season with salt and pepper. Mound the salad in the center of a large serving platter or two dinner plates. Top with the salmon and feta cheese. Sprinkle with chives and basil. Labels: fish, garden, grilling, main dish, salad, seasonal vegetables, vegetables. 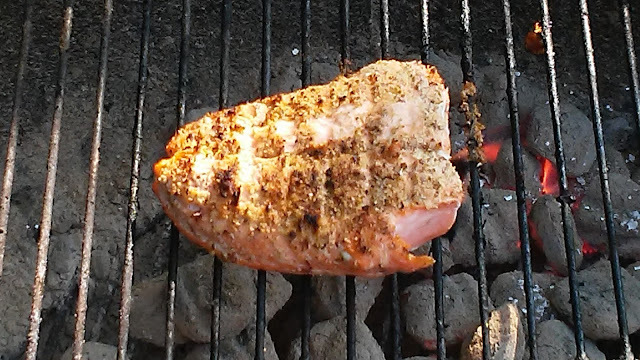 That salmon on the grill looks so good! You have combined all my favourites in just one dish. Wonderful! Thanks Angie, salmon is my favorite too! How I wish we could buy salmon straight off the boats. Love the perfect simplicity of this dish which I'm sure was extremely tasty. Thanks Tandy, we enjoyed this very much. Oh my gosh, that salmon, fresher than fresh! I'm quite sure I'd be eating salmon every day! Love your simple but delicious combination of ingredients Cheri! Thanks Chris, I feel very fortunate this time of year. What a great looking salad and healthy too. Thanks Emma, salmon is one of my favorites! What a delightfully delicious meal! I absolutely love it!! Simple and delicious! Fresh off the boat salmon - you are blessed indeed. Love this simple dinner and orzo is a great layer with the spinach! Outstanding meal I could eat any night. We eat so much salmon...it's our go-to. And you're so right -- fresh salmon does melt in your mouth! This looks so delicious Cheri. Thanks Marcie, love these flavors. Amazing. I see how my favourite fish is elevated to a delicious divine dish. Thanks Nava, appreciate you stopping by! This sounds great, just perfect for summer! Great quick, easy and healthy recipe. We love salmon in this house and we also love spinach- fresh or wilted! Such a wonderful and delicious looking platter, looks straight out of a restaurant. Love how beautifully you have paired grilled salmon, and orzo. I am it tastes so mouthwatering. Thanks Anu, we love our salmon! Oh that sounds good Monica, hope you are having a great week. I finally remembered to use orzo the other day and am now on a kick! haha This sounds like a fantastic meal! This is our kind of weeknight meal! What to try it this week but there is no way it will be as tasty as yours - we just can't get fresh salmon look yours, Cheri! I am jealous over your fresh salmon! It sounds so wonderful!